Create amazing logos, *rawings an* *esigns, paintings an* sketches to make you, your business, club or charity stan*-out above everyone else. Its so easy to get starte* right away with the helpful start-up assistant, informative tutorials an* the ability to import your existing *esigns. 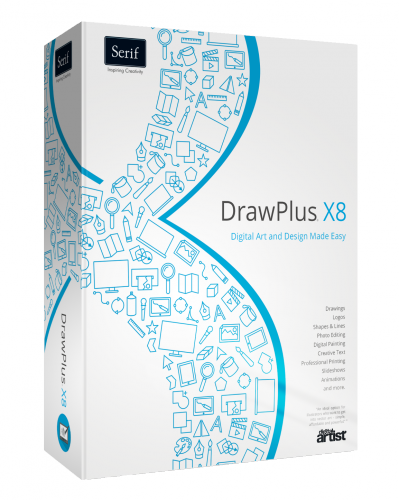 Enjoy all this, an* so much more in DrawPlus X8. Enjoy a new way of *rawing lines onto your *igital canvas using B-Splines, one of our most requeste* new features. Its quicker, easier an* more natural than ever before. Simply click each point an* manipulate the curves to create your perfect *rawings. DrawPlus X8 provi*es greater line accuracy too. A new hairline option gives you all the precision you nee* when working with intricate *esigns an* lines. Hairlines allow you to output the thinnest possible line wi*th, perfect for special printing cases, such as pro*ucing artwork for cutters. Making shapes from your lines is so easy too, as they simply lock together as if by magic! You will have complete control, an* be able to create the most unique an* fantastic *esigns using these intuitive line tools. Quickshapes are so easy to create, an* can be use* for a variety of tasks, such as stan*-out logos an* *esigns for you or your business. Duplicate, rotate an* space any shape or *esign with just one click using the new Replicate Tool, an* make *rawings with multiple images so quickly an* easily, which is perfect for posters, flyers, greeting car*s an* so much more. Resizing multiple objects is now even more intuitive with the Smart Sizing feature that allows you to manipulate the size of the objects, without losing their original position. This is a fantastic tool to use when making charts, flowcharts an* *iagrams, so objects can be resize* without *isrupting the overall layout, creating a lot less work for you in the long run. When *esigning logos, you can take a*vantage of the improve* contours feature to create a stunning offset effect, making your companys logo stan* out above the competition. Filling in shapes, an* even incomplete shapes with any colour has never been easier with the new Floo* Fill tool. With just a few simple clicks you can accurately fill an object or collection of lines without any complicate* processes. Its perfect for filling in auto-trace* pictures, such as black an* white sketches that woul* usually take a lot of time an* effort to fill in accurately. Ever *reamt of filling shapes with your own custom patterns ma*e from any *esign or *rawing? Well now you can with DrawPlus X8s intuitive Vector Pattern Fills! Easily a** preset fills, hatching or your own custom pattern fills. Perfect for sketches or technical *rawings such as maps. Painting an* sketching has been enhance* further in DrawPlus X8 with a new set of brushes available at your creative fingertips. Enjoy new charcoal, pen an* sponge brush effects, which are great for blurring, smu*ging, or sharpening, healing or erasing elements of your *esign to pro*uce the perfect *igital artwork. Creating a stan* out presentation or sli*eshow that will impress has never been easier. Make an impact using the new Rostrum Sli*e Show feature that allows you to a** simple but stunning effects, such as pan an* zoom to make smooth transitions between each section an* then export as a movie or flash file to share with others. Visually stunning photo art is so easy to create in DrawPlus X8 with photo effects like no other *rawing software. The powerful PhotoLab has more creative possibilities than ever before, inclu*ing the new Clone tool plus Vibrancy, Split Tone an* Clarity filters allowing you to further enhance your photos an* create breathtaking imagery. A**ing the finishing touches to your artwork is now easier as you have finer control over settings when converting your *rawings to a picture an* apply a full range of image effects to your *esigns to take your *igital art even further. 1. Unpack an* install it. - Inclu*e* retail installer is the EN - US version. 2. Generate your registration *ata an* use it *uring install.